See the FAQ in the official YouTube Help Forum for details. Read on for details about the changes and a timeline of the integration - and dis-integration - of YouTube and Google+. The ability to share private YouTube videos with a Google+ Circle was removed in February 2016, but videos shared with Circles prior to that change were not affected. Now those Google+ Circles will be removed from the list of people with access to the private video, and the people in those Circles will no longer be able to view that video. Currently you can only share private videos using someone's Google account email address. The ability to update your profile photo and channel's cover art in the mobile was apparently dependent on a system connected to Google+, so will no longer work. 3. On the Details page tap "Edit account info"
That will open the "About Me" page for your channel's Brand Account, where you can update the profile photo. Note that you cannot update channel art on the About Me page. YouTube will no longer support linking to a Google+ profile or page on the About tab, and the link will also be removed from the channel's cover art banner. You can still link to other sites. If your version of the YouTube mobile app hasn't been updated since before September 2016, you will no longer be able to read or post comments. You will need to either update the app, or use the YouTube mobile site (m.youtube.com) in the browser on your device. You can update your Google profile photo (which is used as your channel icon) at aboutme.google.com in the browser on your mobile device. The integration process between YouTube and Google+ began in spring of 2012, but wasn't really complete until November 2013, when YouTube switched to Google+ commenting. The process was complicated and confusing, and alienated a lot of users. Clearing up some of that confusion is why I started this blog in 2013. 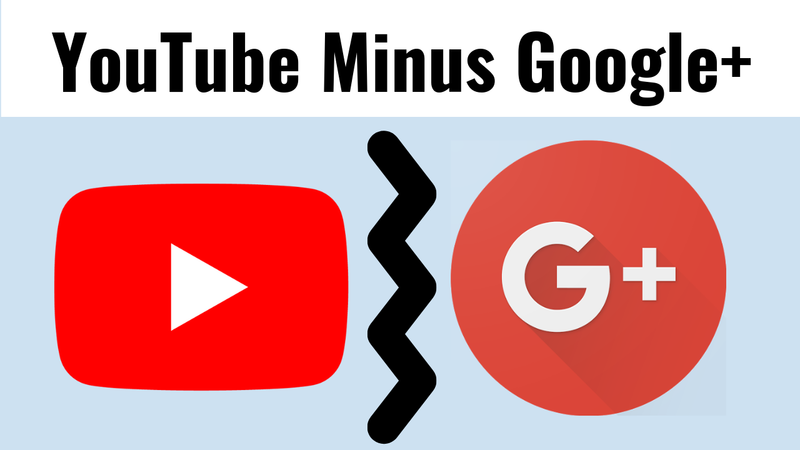 When it was announced in July 2015 that Google+ would no longer be the social layer across Google, YouTube fairly quickly started the disconnection process, and it was possible to create a new channel - and comment - without Google+ within just a few months. Since then, the few remaining Google+-related features have been slowly removed. And now they are gone. February 2016: Option to share private videos with Google+ Circles removed. June 2018: YouTube comments will no longer enforce Google+ age and geographic restriction profile settings.This applies to any comments you’ve made on YouTube. Thanks Peggy - really enjoyed the timeline! It just goes to show how time flies, doesn't it? Is there any situation where YouTube videos would be removed because of being connected to a Google+ account? Chris: no, YouTube accounts will not be affected by the shutdown of consumer Google+. YouTube has been disconnected from Google+ for a long while.